7. Director, Cancer Vaccine Development Program, San Antonio, TX, USA. Background: The optimal treatment of flat epithelial atypia (FEA) found on breast core needle biopsy (CNB) is controversial. We performed a retrospective review of our institutional experience with FEA to determine if excisional biopsy may be deferred. Methods: Surgical records from 2009 to 2012 were reviewed for FEA diagnosis. After exclusion for concomitant lesions, CNBs of pure FEA were classified using a previously agreed upon descriptor of “focal” versus “prominent”. Data was analyzed with the Fisher's Exact and Student-t test as appropriate. Results: Of 71 CNBs evaluated, pure FEA was identified on 27 CNBs. Final excisional biopsy was benign in 24 of 27 cases (88%) with associated ductal carcinoma in-situ (DCIS) in 3 of 27 cases (11%). Eighteen of 27 (67%) CNBs were classified as focal while 9 (33%) were described as prominent. Zero of the 18 focal patients had a malignancy compared to 3 of the 9 in the prominent group (0% vs 33%, p=0.02). Of the 27 pure FEA CNBs, 6 patients had a personal history of breast carcinoma, five DCIS and one invasive ductal carcinoma. No malignancies were found in the 21 patients without a personal history of breast carcinoma versus three in the patients with a positive history (0/21 v 3/6, p=0.007). Conclusions: Our data suggests those women who have adequate sampling and sectioning of CNBs, with focal, pure FEA on pathology, and are without a personal history of breast cancer may undergo a period of imaging surveillance. Conversely, patients with a history of breast cancer or pure, prominent FEA on CNB disease should proceed to excisional biopsy. Keywords: Pure Flat Epithelial Atypia, Ductal Intraepithelial Neoplasia, Pure FEA, DIN 1A, Columnar Cell Change with atypia, Columnar Cell Hyperplasia with Atypia. Since its discovery in 1979 by Azzopardi, flat epithelial atypia (FEA), then called “clinging carcinoma in situ”, has spurred debate as a boundary lesion between the obvious architectural atypia of atypical ductal hyperplasia (ADH) and the normal cytologic appearance of usual ductal hyperplasia (1). FEA's cytologic abnormalities are subtle and often confined to a few ducts. Today, the clinical significance of FEA as a precursor to cancer is still under discussion despite Monifar's and Simpson's isolation of genetic alterations in FEA similar to adjacent, low-grade ductal carcinoma in-situ (DCIS) and well-differentiated invasive carcinomas (2,3). The incidence of pure FEA on CNB excluding the presence of more malignant lesions like ADH, atypical lobular hyperplasia (ALH), lobular carcinoma in-situ (LCIS), DCIS, or invasive ductal carcinoma is between 0.72- 12.2% (9-11). The underestimation (UE) rate of DCIS or invasive carcinoma after pure FEA discovered on CNB has previously been reported, ranging from 0-30% (9-12). The variability in reported UE rates could be attributed to interobserver variability in identifying pure FEA, changing definitions of FEA, the inherent subjectivity of histologic interpretation, the small amount of published data, the lack of large samples, and the long duration necessary for prospective trials. Here, we describe our 3-year single- institution experience with pure FEA on CNB and offer both clinical and pathologic factors which support deferred excision biopsy in favor of radiologic follow-up. This study was part of a department-wide quality improvement initiative focused on improving breast cancer care. As part of a quality improvement project, the Department of Clinical Investigation at San Antonio Military Medical Center waived the requirement for a formal submission to the Institutional Review Board. The details of the study were reviewed by the quality improvement committee, which approved the collection of the data. Three years of electronic medical records (January 2009 to January 2012) of active and retired military personnel and their families were queried for the terms “flat epithelial atypia”, “epithelial atypia”, and “breast atypia”. Patients with additional pathologic designations to include invasive carcinoma, DCIS, LCIS, atypical ductal hyperplasia (ADH), atypical lobular hyperplasia (ALH), phyllodes tumor, pseudoangiomatous stromal hyperplasia (PASH), or fibroadenoma were excluded. Those patients who did not undergo an excisional biopsy, whose final pathology was not available, or whose excisional biopsy did not contain breast tissue were also excluded. The remaining records were reviewed for patient history including previous malignancies, mammographic findings, Breast Imaging and Reporting and Data System (BIRADS) classification, radiologic features, imaging guidance modality, gauge or number of biopsies, the interval between CNB and surgical excision, and pathology examination including previously agreed upon descriptors of FEA, “focal” versus “prominent”,. Focal FEA was defined as FEA involving fewer than three adjacent acinar spaces within a lobule or adjacent lobules, while prominent FEA involves widespread acini with FEA and/or a larger confluent focus of FEA (Figure 1). All CNBs were processed via 3 H&E-stained step sections; if questions remained regarding the diagnosis, additional material was obtained using previously cut, unstained material. A final review of pathologic specimens was conducted by the chief of pathology. A-B Lowest end of Focal Flat Epithelial Atypia spectrum (at 10x and 20x magnification, respectively). Within this lobule, some acini exhibit round dilated acini with subtly enlarged and rounded nuclei with increased nuclear to cytoplasmic ratio (leading to basophilic appearance from hyperchromasia) and prominent nucleoli, and some nuclei no longer are oriented perpendicular to the acini's basement membrane (microscopic features of FEA). Secretions and microcalcifications are present within the some of the acinar lumina (which can be seen in FEA or non-involved acini). C Focal Flat Epithelial Atypia at 10x magnification, single lobule with the basophilic appearance characteristic of increased nuclear to cytoplasmic ratio and nuclear hyperchromasia; other nuclear atypia consisting of nucleoli and disorganized nuclear arrangement is visible along with occasional bi-nucleation. Some cells have apical snouts, a non-specific finding. D-E Prominent Flat Epithelial Atypia (10x magnification): Multiple lobules with enlarged, rounded or irregularly dilated acini, which exhibit basophilia due to increased nuclear to cytoplasmic ratio and nuclear hyperchromasia, are evident. Prominent Flat Epithelial Atypia (20x magnification): Monomorphic population of rounded and enlarged nuclei, not regularly oriented perpendicular to the basement membrane, with prominent nucleoli lining multiple lobules. Some acini contain microcalcifications and majority of cells exhibit apical snouts. A total of 71 core needle biopsies (CNBs) with flat epithelial atypia (FEA) were reviewed. Sixty-two percent (n=44) were excluded for presence of a separate surgical indication or lack of adequate excisional biopsy (EB). Pure FEA core needle biopsies were designated as “focal” or “prominent”. The focal FEA group contained no malignancies on excisional biopsy, compared to 33% (n=3) in the prominent group (0% v. 33%, p=0.02). Statistical analysis was based on Student's t-tests for parametric continuous variables and Fisher's exact test for comparison of categorical variables. P values less than 0.05 were considered significantly different. Statistical analyses were performed using SPSS Version 19. A total of 148 CNBs were identified from a review of electronic medical records from January 2009 to January 2012 using a query of the terms “flat epithelial atypia”, “epithelial atypia”, and “breast atypia”. Upon further review of the pathology, FEA was found to be present in 48% of these CNBs (n=71). Of the 71 CNBs specimens with FEA, 55% (n=39) were excluded due to the presence of the concomitant pathologic designations described above (Figure 2). These lesions included: 21% (n=15) ADH, 16% (n=11) DCIS, 6% (n=4) LCIS, 4% (n=3) PASH, 3% (n=2) invasive carcinoma, 3% (n=2) ALH, 1% (n=1) fibroadenoma, and 1% (n=1) phyllodes tumor. Of the remaining 32 CNBs, 7% (n=5) were also excluded due to the lack of an excisional biopsy, an excisional biopsy that did not contain breast tissue, or no excisional biopsy pathology record. As a result, pure FEA was identified from 38% of the 71 CNBs with FEA (n=27) (Figure 3). Pure, Flat epithelial atypia was identified on 38% (27/71) of core needle biopsies (CNBs). Sixty-two percent of patients were excluded for a lack of an adequate excisional biopsy or the presence of a concomitant lesion; ductal carcinoma in-situ (DCIS), lobular carcinoma in-situ (LCIS), atypical ductal hyperplasia (ADH), atypical lobular hyperplasia (ALH), phyllodes tumor, pseudoangiomatous stromal hyperplasia (PASH), or fibroadenoma. Of the 71 CNBs with FEA, 27 contained pure FEA and will be the focus of this analysis. CNBs of pure FEA were largely the result of a BIRADS 4 or greater designation (92%, n=25). Specifically, suspicious microcalcifications accounted for 67% of pure FEA CNBs (n=18) and the remaining 33% (n=9) of CNBs were done for focal asymmetry. Stereotactic guidance was performed for 67% (n=18) of pure FEA CNBs. The remaining CNBs were guided by ultrasound, 30% (n=8), or by magnetic resonance imaging (MRI), 4% (n=1). Seventy-four percent (n=20) of CNBs were done with an 8-gauge needle with a mean of 5.3+1.3 biopsies (Table 1). All patients underwent a needle localized, excisional breast biopsy performed by eight different surgeons. Mean time between CNB and excisional biopsy was 37 days, range 7-261. Pure FEA was identified from 27 patients. After CNB, 67% (n=18) had a single focus of FEA while 33% (n=9) were described as prominent. There were no statistical differences between the focal and prominent FEA groups with respect to mammographic findings worthy of biopsy including microcalcifications, BIRADS classification, imaging guidance modality, gauge or number of biopsies, laterality of previous cancers, or the interval between CNB and surgical excision groups (Table 1). After excisional biopsy, no malignancies (0/18) were identified in the focal, pure FEA group compared to 33% (n=3/9) of the prominent group (0% v. 33%, p=0.02) (Figure 2). Demographics of those patients with a CNB identified as pure FEA. The 27 pure, FEA biopsies findings were subdivided into focal FEA in (66.7%, n=18) and prominent FEA (33.3%, n=9). 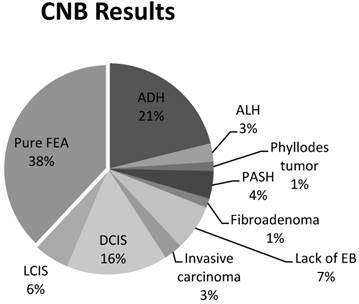 After surgical excision, no cases of invasive carcinoma were identified from the 27 CNBs identified as pure FEA. Benign findings occurred in 88.8% (n=24) of the pure FEA excisional biopsies and DCIS was reported in the remaining 11.2% (n=3). Of the 27 pure FEA CNBs, 22% (n=6) patients had a personal history of breast cancer: 19% (n=5) DCIS and 3% (n=1) invasive ductal carcinoma. Of the 6 patients with prior breast cancer, 1 CNB was classified as focal FEA while 5 CNBs were prominent FEA. Four of the pure FEA biopsies were in the ipsilateral breast, while two were in the contralateral breast (p=0.33). There were no malignancies found in the 21 patients without a personal history of breast carcinoma versus 50% (n=3) in the patients with a history of breast cancer (0/21 v. 3/6, p=0.007). The rate at which CNB fails to predict more malignant lesions on surgical excision is termed the underestimation (UE) rate. As expected, the UE rate is a function of the amount of tissue sampled at CNB, sampling accuracy of the imaged abnormality, and the slide rating defined by the number of slides through a surgical specimen. In our study, the UE rate of carcinoma for a CNB of pure FEA was 11%. If focal FEA was adequately demonstrated with CNB, the pure FEA UE rate was 0% compared to a 33% UE rate in prominent FEA. In regards to clinical characteristics, a personal history of breast cancer combined with pure FEA on CNB resulted in an UE rate of 50%. To determine the incidence of FEA as a marker lesion of adjacent cancer, a retrospective review of excision, core, or mastectomy specimens with microcalcifications was undertaken by De Mascarel et al. (13). After reviewing 971 surgically excised biopsies with atypia, pure FEA with concomitant cancer was identified in 17% of cases. In a smaller sample size, Abdel-Fatah et al. show a FEA, not pure FEA, to tubular carcinoma association as high as 84% in 56 patients with a lesser association with invasive lobular carcinoma of 54% in 57 patients (14). Therefore the true incidence of concomitant pure FEA and breast cancer is hard to predict but is probably close to 17%. However, these studies do not evaluate the typical clinical management pathway for evaluating suspicious mammographic lesions, which might include image guided CNB, surgical excision, or follow-up imaging and instead evaluate only the surgical biopsy results. In comparison studies, using the typical clinical pathway, incidence of isolated pure FEA on CNB is considerably lower, between 0.72-12.2% (9-11). 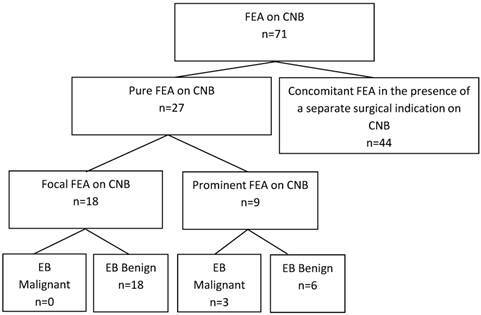 The difference between these two rates, the 17% incidence of pure FEA with cancer at surgical specimen and 0.72-12.2% pure FEA on CNB and associated cancer on surgical excision, is likely the true UE rate. In the current literature, if the FEA on CNB is used to predict excisional biopsy results, UE rates regardless of CNB gauge are between 0-29% (7-12, 15-19). In studies using a 14-gauge CNB, UE rates are between 14-21% with an average number of 5 samples or 200mg of tissue (10, 17). In studies with 11-gauge CNB, UE rates are between 0-20% (7, 9, 12, 19-20). In this study, 74% of CNBs of pure FEA were performed with 8-gauge core needles, and the mean number of CNBs was 6 (approximately 600mg of tissue). The UE rate for all isolated FEA on CNB in our institutional experience was found to be 11%, similar to previous studies using 11-gauge sampling, and a rate at which many surgeons would feel uncomfortable with radiographic surveillance alone. Identifying subsets of pure FEA with a lower risk of UE, who therefore could safely be observed with serial imaging alone, could decrease the time, cost, discomfort and morbidity of excisional biopsy in many cases. The idea to subdivide FEA was undertaken by Bonnett et al. (20) in a retrospective analysis of atypical lesions in image guided core biopsies. The investigators found that after categorizing ALH, ADH with minimal atypia, ADH/borderline DCIS, and FEA by the number of foci on CNB, the number of involved foci correlated to the presence of DCIS on open biopsy (20). In a different study, Martel et al. (10) reviewed 1,751 CNBs over eight years, 3.6% (n=63) of which were FEA as the most advanced pathology, not pure FEA. Cases were further characterized by the extent of FEA; specifically into those having less than five terminal ductal lobular units (TDLUs), five to ten TDLUs, or greater than 10 TDLUs involved. Of the seven patients with FEA and ipsilateral invasive carcinoma, 5 (71%) had greater than 10 ductules (greater than 2 terminal duct lobular units TDLUs) involved (10). Of note, the mean interval between initial CNB and surgical excision for this study was 3.7 years. Pathologists at San Antonio Military Medical Center began prospectively labeling cases of pure FEA as focal or prominent beginning in 2007. At our three year review, the UE rate in those with prominent FEA is 33% while the UE rate in those with focal FEA is 0%. Keeping with the previous findings of Bonnet et al. (20), this difference in UE rates suggests prominent FEA may better identify patients at risk for surrounding DCIS or invasive carcinoma and thus guide surgical excision. While focal FEA may become prominent over time, it poses little risk of surrounding cancer at the time of CNB. Further prospective studies will be needed to determine the longer-term risk of transformation into more aggressive lesions. However, in a recent long-term cohort study from the Mayo Clinic in 11,591 women with benign excisional breast biopsies with a median follow-up of 16.8 years, the finding of FEA did not appear to impart independent risk of breast cancer beyond that atypical hyperplasia or proliferative disease without atypia (21). After demographic analysis, no malignancies were found in the 21 patients without a personal history of invasive carcinoma or DCIS versus 3 in the 6 patients with a history of carcinoma. In addition, there were significantly more women with a personal history of breast cancer in the prominent, pure FEA group (5) than in the focal, pure FEA group (1). Therefore, the effect of a personal history of breast cancer can be difficult to separate from the pathologic designation (prominent vs. focal) of FEA. The role of personal history of breast cancer in FEA UE rate is mixed in previous studies. A retrospective analysis by Peres et al. (19) found no correlation between personal history of cancer and underestimation of carcinoma in 128 cases of pure FEA by 11 gauge CNB obtained over a 7-year period. In contrast, Lavoue and Becker et al. (8, 11) demonstrate that 18-30% of women who were underestimated by pure FEA on CNB had a personal or family history of breast cancer. Taken as a whole, until better data is available, it is prudent to consider personal history when deciding not to proceed with excisional biopsy based on a CNB finding of pure FEA. Our study is also limited by the relatively small number of cases of pure FEA within CNBs; however, our series represents one of the largest studies of pure FEA and is unique in the attempt to divide FEA into histologic subgroups. It is unlikely that any single factor will be sufficient to determine whether a patient with pure FEA on CNB should forgo excisional biopsy. Our data suggests those women with a history of breast cancer or pure, prominent FEA on CNB should proceed to excisional biopsy. Conversely, those patients who have adequate sampling and sectioning of CNBs, with focal, pure FEA on pathology, and are without a personal history of breast cancer may undergo a period of imaging surveillance. The authors would like to thank Mrs. Susie Ferrise and Mrs. Karen Degroat for their database management, editorial expertise, and literary searches. FEA: Focal epithelial atypia; CNB: core needle biopsy; EB: excisional biopsy; PASH: pseudoangiomatous stromal hyperplasia; ADH: atypical ductal hyperplasia; ALH: atypical lobular hyperplasia; LCIS: lobular carcinoma in-situ; DCIS: ductal carcinoma in-situ; DIN: ductal intraepithelial neoplasia; WHO: World Health Organization; BIRADS: Breast Imaging and Reporting and Data System; TDLU: terminal ductal lobular unit. Corresponding author: Dr. John S. Berry, M.D. San Antonio Military Medical Center, Department of General Surgery 3551 Roger Brooke Dr. Ft. Sam Houston, TX 78234 Office: 210-916-0439 Fax: 210-916-6658 Email: john.s.berry.milmil.